Established 2007. Offering carryout, delivery & catering. PERSONAL (2 Slices): Serving Size (g): 152, Servings Per Container: 2, Calories: 380, Calories From Fat: 190, Total Fat (g): 22, Saturated Fat (g): 7, Trans Fat (g): 0, Cholesterol (mg): 25, Sodium (mg): 310, Carbohydrates (g): 31, Dietary Fiber (g): 0, Sugars (g): 2, Protein (g): 16. SMALL (4 Slices): Serving Size (g): 185, Servings Per Container: 4, Calories: 470, Calories From Fat: 240, Total Fat (g): 26, Saturated Fat (g): 10, Trans Fat (g): 0.5, Cholesterol (mg): 35, Sodium (mg): 430, Carbohydrates (g): 38, Dietary Fiber (g): 0, Sugars (g): 2, Protein (g): 23. MEDIUM (6 Slices): Serving Size (g): 204, Servings Per Container: 6, Calories: 530, Calories From Fat: 230, Total Fat (g): 29, Saturated Fat (g): 11, Trans Fat (g): 0.5, Cholesterol (mg): 40, Sodium (mg): 440, Carbohydrates (g): 45, Dietary Fiber (g): 0, Sugars (g): 2, Protein (g): 25. LARGE (8 Slices): Serving Size (g): 221, Servings Per Container: 8, Calories: 590, Calories From Fat: 280, Total Fat (g): 31, Saturated Fat (g): 12, Trans Fat (g): 0.5, Cholesterol (mg): 40, Sodium (mg): 480, Carbohydrates (g): 50, Dietary Fiber (g): 0, Sugars (g): 2, Protein (g): 27. PERSONAL (2 Slices): Serving Size (g): 173, Servings Per Container: 2, Calories: 490, Calories From Fat: 280, Total Fat (g): 32, Saturated Fat (g): 12, Trans Fat (g): 0.5, Cholesterol (mg): 60, Sodium (mg): 510, Carbohydrates (g): 30, Dietary Fiber (g): 0, Sugars (g): 1, Protein (g): 21. SMALL (4 Slices): Serving Size (g): 228, Servings Per Container: 4, Calories: 600, Calories From Fat: 330, Total Fat (g): 37, Saturated Fat (g): 15, Trans Fat (g): 0.5, Cholesterol (mg): 75, Sodium (mg): 730, Carbohydrates (g): 38, Dietary Fiber (g): 1, Sugars (g): 2, Protein (g): 29. MEDIUM (6 Slices): Serving Size (g): 254, Servings Per Container: 6, Calories: 670, Calories From Fat: 370, Total Fat (g): 41, Saturated Fat (g): 16, Trans Fat (g): 0.5, Cholesterol (mg): 85, Sodium (mg): 840, Carbohydrates (g): 45, Dietary Fiber (g): 1, Sugars (g): 2, Protein (g): 33. LARGE (8 Slices): Serving Size (g): 271, Servings Per Container: 8, Calories: 730, Calories From Fat: 390, Total Fat (g): 44, Saturated Fat (g): 17, Trans Fat (g): 0.5, Cholesterol (mg): 90, Sodium (mg): 900, Carbohydrates (g): 50, Dietary Fiber (g): 1, Sugars (g): 2, Protein (g): 35. Made with Lou's lean sausage, some extra cheese and vine-ripened tomato sauce on Buttercrust.™ It's authentic Chicago! PERSONAL (2 Slices): Serving Size (g): 216, Servings Per Container: 2, Calories: 450, Calories From Fat: 250, Total Fat (g): 28, Saturated Fat (g): 10, Trans Fat (g): 0, Cholesterol (mg): 35, Sodium (mg): 440, Carbohydrates (g): 33, Dietary Fiber (g): 1, Sugars (g): 3, Protein (g): 19. SMALL (4 Slices): Serving Size (g): 232, Servings Per Container: 4, Calories: 490, Calories From Fat: 260, Total Fat (g): 28, Saturated Fat (g): 10, Trans Fat (g): 0, Cholesterol (mg): 35, Sodium (mg): 460, Carbohydrates (g): 40, Dietary Fiber (g): 1, Sugars (g): 3, Protein (g): 21. MEDIUM (6 Slices): Serving Size (g): 256, Servings Per Container: 6, Calories: 550, Calories From Fat: 280, Total Fat (g): 31, Saturated Fat (g): 11, Trans Fat (g): 0, Cholesterol (mg): 40, Sodium (mg): 490, Carbohydrates (g): 47, Dietary Fiber (g): 1, Sugars (g): 3, Protein (g): 23. LARGE (8 Slices): Serving Size (g): 272, Servings Per Container: 8, Calories: 600, Calories From Fat: 310, Total Fat (g): 34, Saturated Fat (g): 12, Trans Fat (g): 0, Cholesterol (mg): 40, Sodium (mg): 500, Carbohydrates (g): 52, Dietary Fiber (g): 1, Sugars (g): 3, Protein (g): 24. A pizza so good we gave it his name! Spinach mix, mushrooms and sliced roma tomatoes covered with blend of mozzarella, romano and cheddar cheese on garlic Buttercrust.™ No substitutions please. PERSONAL (2 Slices): Serving Size (g): 87, Servings Per Container: 3, Calories: 200, Calories From Fat: 120, Total Fat (g): 14, Saturated Fat (g): 6, Trans Fat (g): 0, Cholesterol (mg): 40, Sodium (mg): 490, Carbohydrates (g): 2, Dietary Fiber (g): 0, Sugars (g): 1, Protein (g): 15. SMALL (4 Slices): Serving Size (g): 86, Servings Per Container: 7, Calories: 190, Calories From Fat: 120, Total Fat (g): 13, Saturated Fat (g): 6, Trans Fat (g): 0, Cholesterol (mg): 45, Sodium (mg): 510, Carbohydrates (g): 2, Dietary Fiber (g): 0, Sugars (g): 1, Protein (g): 15. MEDIUM (6 Slices): Serving Size (g): 96, Servings Per Container: 11, Calories: 200, Calories From Fat: 120, Total Fat (g): 14, Saturated Fat (g): 6, Trans Fat (g): 0, Cholesterol (mg): 45, Sodium (mg): 570, Carbohydrates (g): 2, Dietary Fiber (g): 0, Sugars (g): 1, Protein (g): 16. LARGE (8 Slices): Serving Size (g): 200, Servings Per Container: 15, Calories: 200, Calories From Fat: 120, Total Fat (g): 13, Saturated Fat (g): 6, Trans Fat (g): 0, Cholesterol (mg): 45, Sodium (mg): 560, Carbohydrates (g): 2, Dietary Fiber (g): 0, Sugars (g): 1, Protein (g): 16. Perfect for those on a gluten-free or low-carb diet, our "Crustless" pizza is made with Lou's lean sausage as the base, and then topped with mozzarella cheese and vine-ripened tomato sauce. CHEESE SMALL: Serving Size (g): 80, Servings Per Container: 4, Calories: 220, Calories From Fat: 120, Total Fat (g): 14, Saturated Fat (g): 6, Trans Fat (g): 0, Cholesterol (mg): 20, Sodium (mg): 160, Carbohydrates (g): 15, Dietary Fiber (g): 0, Sugars (g): 1, Protein (g): 8. CHEESE MEDIUM: Serving Size (g): 104, Servings Per Container: 6, Calories: 270, Calories From Fat: 150, Total Fat (g): 17, Saturated Fat (g): 7, Trans Fat (g): 0, Cholesterol (mg): 25, Sodium (mg): 220, Carbohydrates (g): 20, Dietary Fiber (g): 0, Sugars (g): 1, Protein (g): 11. CHEESE LARGE: Serving Size (g): 111, Servings Per Container: 8, Calories: 300, Calories From Fat: 170, Total Fat (g): 19, Saturated Fat (g): 8, Trans Fat (g): 0, Cholesterol (mg): 30, Sodium (mg): 250, Carbohydrates (g): 21, Dietary Fiber (g): 0, Sugars (g): 1, Protein (g): 12. SMALL GLUTEN-FREE CHEESE: Serving Size (g): 113, Servings Per Container: 2, Calories: 410, Calories From Fat: 240, Total Fat (g): 27, Saturated Fat (g): 2, Trans Fat (g): 0, Cholesterol (mg): 30, Sodium (mg): 105, Carbohydrates (g): 39, Dietary Fiber (g): 2, Sugars (g): 2, Protein (g): 3. Lou's gluten-free crust pizzas are prepared in a sterile environment, but are finished in our kitchen where wheat and wheat products are present. Prices are per topping. Full price charged for 1/2 portions. Sausage, pepperoni, mushrooms, onions, jalapeños, green peppers, black olives, basil, sliced roma tomatoes, extra cheese, garlic, hot giardiniera, anchovies, extra tomato sauce or fresh spinach mix (enhanced with garlic, basil & onion). Lower-in-fat cheese available upon request. Serving Size (g): 173, Servings Per Container: 2, Calories: 379, Calories from Fat: 241, Total Fat (g): 27, Saturated Fat (g): 10, Trans Fat (g): 0, Cholesterol (mg): 21, Sodium (mg): 600, Carbohydrates (g): 24, Dietary Fiber (g): 1, Sugars (g): 4, Protein (g): 11. BUFFALOU WINGS: Serving Size (g): 230, Servings Per Container: 2, Calories: 726, Calories from Fat: 524, Total Fat (g): 58, Saturated Fat (g): 18, Trans Fat (g): 4, Cholesterol (mg): 162, Sodium (mg): 2481, Carbohydrates (g): 11, Dietary Fiber (g): 1, Sugars (g): 5, Protein (g): 42. BAR-B-LOU WINGS: Serving Size (g): 366, Servings Per Container: 2, Calories: 805, Calories from Fat: 590, Total Fat (g): 66, Saturated Fat (g): 19, Trans Fat (g): 1, Cholesterol (mg): 168, Sodium (mg): 2810, Carbohydrates (g): 15, Dietary Fiber (g): 2, Sugar (g): 8, Protein (g): 42. REDUCED CALORIE RANCH DRESSING (DIPPING SAUCE): Serving Size (g): 36, Servings Per Container: 2, Calories: 70, Calories from Fat: 55, Total Fat (g): 6, Saturated Fat (g): 1, Trans Fat (g): 0, Cholesterol (mg): 3, Sodium (mg): 267, Carbohydrates (g): 3, Dietary Fiber (g): 0, Sugars (g): 1, Protein (g): 1. CELERY: Serving Size (g): 25, Servings Per Container: 2, Calories: 4, Calories from Fat: 0, Total Fat (g): 0, Saturated Fat (g): 0, Trans Fat (g): 0, Cholesterol (mg): 0, Sodium (mg): 20, Carbohydrates (g): 1, Dietary Fiber (g): 0, Sugars (g): 0, Protein (g): 0. THREE-CHEESE BREAD: Serving Size (g): 135, Servings Per Container: 2, Calories: 453, Calories from Fat: 211, Total Fat (g): 24, Saturated Fat (g): 13, Trans Fat (g): 0, Cholesterol (mg): 42, Sodium (mg): 831, Carbohydrates (g): 40, Dietary Fiber (g): 0, Sugars (g): 2, Protein (g): 18. MARINARA SAUCE (DIPPING SAUCE): Serving Size (g): 125, Servings Per Container: 2, Calories: 80, Calories from Fat: 8, Total Fat (g): 1, Saturated Fat (g): 0, Trans Fat (g): 0, Cholesterol (mg): 0, Sodium (mg): 821, Carbohydrates (g): 20, Dietary Fiber (g): 4, Sugars (g): 11, Protein (g): 3. GARLIC BREAD: Serving Size (g): 119, Servings Per Container: 2, Calories: 395, Calories from Fat: 144, Total Fat (g): 16, Saturated Fat (g): 7, Trans Fat (g): 0, Cholesterol (mg): 6, Sodium (mg): 759, Carbohydrates (g): 51, Dietary Fiber (g): 0, Sugars (g): 2, Protein (g): 9. All feature salads feed two to three people. Family-sized salads are for four to five people. MEDIUM: Serving Size (g): 352, Servings Per Container: 2, Calories: 560, Calories From Fat: 380, Total Fat (g): 43, Saturated Fat (g): 12, Trans Fat (g): 0, Cholesterol (mg): 50, Sodium (mg): 1680, Carbohydrates (g): 26, Dietary Fiber (g): 5, Sugars (g): 19, Protein (g): 22. FAMILY: Serving Size (g): 262, Servings Per Container: 5, Calories: 440, Calories From Fat: 300, Total Fat (g): 35, Saturated Fat (g): 10, Trans Fat (g): 0, Cholesterol (mg): 40, Sodium (mg): 1340, Carbohydrates (g): 20, Dietary Fiber (g): 4, Sugars (g): 15, Protein (g): 18. MEDIUM: Serving Size (g): 223, Servings Per Container: 2, Calories: 355, Calories from Fat: 283, Total Fat (g): 31, Saturated Fat (g): 8, Trans Fat (g): 0, Cholesterol (mg): 38, Sodium (mg): 840, Carbohydrates (g): 8, Dietary Fiber (g): 4, Sugars (g): 4, Protein (g): 10. FAMILY: Serving Size (g): 447, Servings Per Container: 4, Calories: 712, Calories from Fat: 567, Total Fat (g): 63, Saturated Fat (g): 15, Trans Fat (g): 0, Cholesterol (mg): 77, Sodium (mg): 1687, Carbohydrates (g): 16, Dietary Fiber (g): 7, Sugars (g): 8, Protein (g): 21. CROUTONS (MEDIUM): Serving Size (g): 10, Servings Per Container: 2, Calories: 49, Calories from Fat: 28, Total Fat (g): 3, Saturated Fat (g): 1, Trans Fat (g): 0, Cholesterol (mg): 1, Sodium (mg): 78, Carbohydrates (g): 4, Dietary Fiber (g): 0, Sugars (g): 0, Protein (g): 1. CROUTONS (FAMILY): Serving Size (g): 10, Servings Per Container: 4, Calories: 49, Calories from Fat: 28, Total Fat (g): 3, Saturated Fat (g): 1, Trans Fat (g): 0, Cholesterol (mg): 1, Sodium (mg): 78, Carbohydrates (g): 4, Dietary Fiber (g): 0, Sugars (g): 0, Protein (g): 1. MEDIUM: Serving Size (g): 266, Servings Per Container: 2, Calories: 117, Calories from Fat: 11, Total Fat (g): 1, Saturated Fat (g): 0, Trans Fat (g): 0, Cholesterol (mg): 0, Sodium (mg): 581, Carbohydrates (g): 25, Dietary Fiber (g): 7, Sugars (g): 15, Protein (g): 6. FAMILY: Serving Size (g): 250, Servings Per Container: 4, Calories: 51, Calories from Fat: 4, Total Fat (g): 0, Saturated Fat (g): 0, Trans Fat (g): 0, Cholesterol (mg): 0, Sodium (mg): 31, Carbohydrates (g): 11, Dietary Fiber (g): 4, Sugars (g): 6, Protein (g): 3. A gluten-free option when served without croutons. Housemade Salad Dressings: House Red Wine Vinaigrette, Thousand Island, Creamy Lemon Garlic, Gorgonzola, and Reduced-Calorie Ranch. All pasta dinners come with garlic bread. Sauces are housemade from scratch - daily! Serving Size (g): 863, Servings Per Container: 1, Calories: 1389, Calories from Fat: 616, Total Fat (g): 69, Saturated Fat (g): 39, Trans Fat (g): 2, Cholesterol (mg): 193, Sodium (mg): 2000, Carbohydrates (g): 115, Dietary Fiber (g): 7, Sugars (g): 12, Protein (g): 76. NO SAUCE: Serving Size (g): 450, Servings Per Container: 1, Calories: 743, Calories from Fat: 319, Total Fat (g): 35, Saturated Fat (g): 21, Trans Fat (g): 1, Cholesterol (mg): 98, Sodium (mg): 3096, Carbohydrates (g): 65, Dietary Fiber (g): 6, Sugars (g): 13, Protein (g): 46. WITH MARINARA SAUCE: Serving Size (g): 558, Servings Per Container: 1, Calories: 812, Calories from Fat: 326, Total Fat (g): 36, Saturated Fat (g): 21, Trans Fat (g): 1, Cholesterol (mg): 98, Sodium (mg): 3803, Carbohydrates (g): 82, Dietary Fiber (g): 9, Sugars (g): 22, Protein (g): 49. WITH MEAT SAUCE: Serving Size (g): 561, Servings Per Container: 1, Calories: 872, Calories from Fat: 385, Total Fat (g): 43, Saturated Fat (g): 24, Trans Fat (g): 1, Cholesterol (mg): 120, Sodium (mg): 3412, Carbohydrates (g): 73, Dietary Fiber (g): 7, Sugars (g): 18, Protein (g): 52. SPAGHETTI W/ MEAT SAUCE: Serving Size (g): 784, Servings Per Container: 1, Calories: 1049, Calories from Fat: 294, Total Fat (g): 33, Saturated Fat (g): 13, Trans Fat (g): 1, Cholesterol (mg): 86, Sodium (mg): 1710, Carbohydrates (g): 136, Dietary Fiber (g): 10, Sugars (g): 23, Protein (g): 45. SPAGHETTI W/ MARINARA SAUCE: Serving Size (g): 772, Servings Per Container: 1, Calories: 811, Calories from Fat: 55, Total Fat (g): 6, Saturated Fat (g): 1, Trans Fat (g): 0, Cholesterol (mg): 0, Sodium (mg): 3274, Carbohydrates (g): 172, Dietary Fiber (g): 19, Sugars (g): 40, Protein (g): 32. CHEESE RAVIOLI WITH MARINARA SAUCE: Serving Size (g): 255, Servings Per Container: 1, Calories: 190, Calories from Fat: 25, Total Fat (g): 3, Saturated Fat (g): 2, Trans Fat (g): 0, Cholesterol (mg): 5, Sodium (mg): 1080, Carbohydrates (g): 37, Dietary Fiber (g): 5, Sugar (g): 14, Protein (g): 7. CHEESE RAVIOLI WITH MEAT SAUCE: Serving Size (g): 255, Servings Per Container: 1, Calories: 230, Calories from Fat: 70, Total Fat (g): 8, Saturated Fat (g): 4, Trans Fat (g): 0, Cholesterol (mg): 20, Sodium (mg): 750, Carbohydrates (g): 29, Dietary Fiber (g): 3, Sugar (g): 10, Protein (g): 9. Serving Size (g): 563, Servings Per Container: 1, Calories: 840, Calories From Fat: 230, Total Fat (g): 25, Saturated Fat (g): 11, Trans Fat (g): 0, Cholesterol (mg): 260, Sodium (mg): 3450, Carbohydrates (g): 67, Dietary Fiber (g): 1, Sugars (g): 6, Protein (g): 78. Serving Size (g): 41, Servings Per Container: 2, Calories: 120, Calories from Fat: 60, Total Fat (g): 7, Saturated Fat (g): 4, Trans Fat (g): 0, Cholesterol (mg): 28, Sodium (mg): 28, Carbohydrates (g): 12, Dietary Fiber (g): 0, Sugar (g): 9, Protein (g): 2. 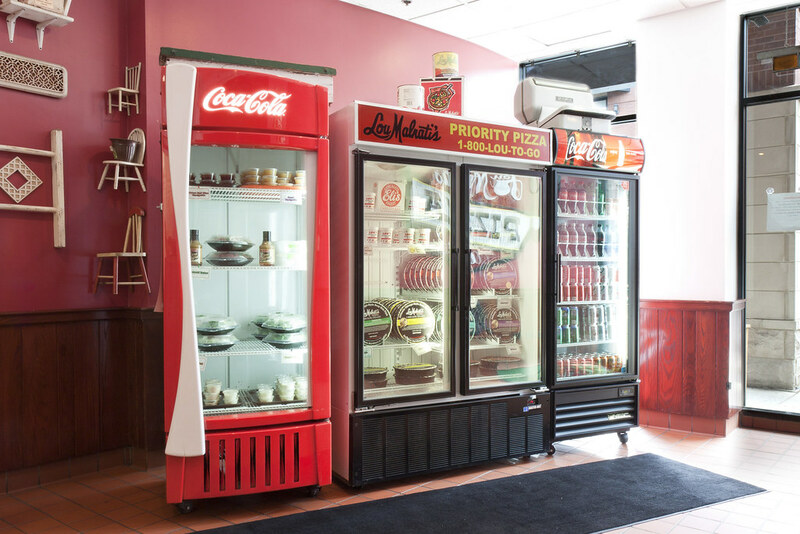 Provide a delicious meal for a party of any size with Lou Malnati’s Catering. We offer the famous Chicago-style pizza you love, paired with fresh salads, homemade pastas, appetizers, and more, all appropriately-sized for your event – whether you're feeding a group of 10, or a crowd of hundreds. For help placing your order, please call (847) 562-1918 to speak with a member of our Catering Crew. Lou Malnati's is legendary for its pizza in the pan. And although at Lou's sausage is the specialty of the house, you can order your pizza just how you like it: well done or gooey, easy on the sausage or tomato - no problem! A pizza so good we gave it his name! Fresh spinach, mushrooms and sliced tomatoes covered with a blend of mozzarella, romano and cheddar cheese on garlic Buttercrust.™ No substitutions please. Sausage, pepperoni, mushrooms, onions, jalapeños, green peppers, black olives, basil, sliced roma tomatoes, extra cheese, garlic, hot giardiniera, anchovies, extra tomato sauce, or fresh spinach mix (enhanced with garlic, basil & onion). Lower-in-fat cheese available upon request. For a quick, grab-n-go lunch, we offer our individual pizza, boxed for one person, and paired with a separately boxed side house salad and dressing, drink and utensils. Perfect for groups of any size who need their meal individually packaged. Add on a cookie for dessert for $1.30. SMALL WITH MEAT SAUCE: Serving Size (g): 340, Servings Per Container: 10, Calories: 455. MEDIUM WITH MEAT SAUCE: Serving Size (g): 455, Servings Per Container: 20, Calories: 372. LARGE WITH MEAT SAUCE: Serving Size (g): 357, Servings Per Container: 30, Calories: 364. SMALL WITH MARINARA SAUCE: Serving Size (g): 417, Servings Per Container: 10, Calories: 357. MEDIUM WITH MARINARA SAUCE: Serving Size (g): 403, Servings Per Container: 20, Calories: 292. LARGE WITH MARINARA SAUCE: Serving Size (g): 411, Servings Per Container: 30, Calories: 286. SMALL CHICKEN LOUIE: Serving Size (g): 400, Servings Per Container: 10, Calories: 653. MEDIUM CHICKEN LOUIE: Serving Size (g): 362, Servings Per Container: 20, Calories: 592. LARGE CHICKEN LOUIE: Serving Size (g): 361, Servings Per Container: 30, Calories: 590. Fettuccini tossed in Mamma Malnati's family recipe cream sauce, then baked with mozzaella on top. SMALL: Serving Size (g): 417, Servings Per Container: 10, Calories: 671. MEDIUM: Serving Size (g): 403, Servings Per Container: 20, Calories: 648. LARGE: Serving Size (g): 411, Servings Per Container: 30, Calories: 662. For the pasta fanatic! 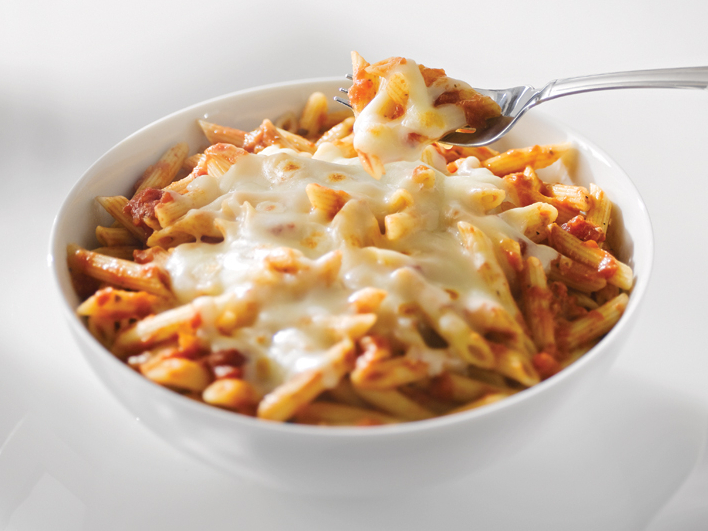 We fold cream and romano cheese into our housemade meat sauce then stir in penne and bake it all with mozzarella cheese. Delicious double-stuffed jumbo raviolis filled with a blend of romano, parmesan, asiago, and ricotta cheese, then tossed lightly with your choice of marinara or meat sauce. SMALL: Serving Size (g): 300, Servings Per Container: 10, Calories: 499. MEDIUM: Serving Size (g): 248, Servings Per Container: 20, Calories: 414. LARGE: Serving Size (g): 255, Servings Per Container: 30, Calories: 425. Rigatoni pasta in a creamy marsala sauce with grilled chicken, oven roasted tomatoes and mushrooms. SMALL: Serving Size (g): 558, Servings Per Container: 10, Calories: 812. MEDIUM: Serving Size (g): 561, Servings Per Container: 20, Calories: 872. Layers of spinach and three cheeses topped with meat or marinara sauce. SMALL: Serving Size (g): 417, Servings Per Container: 10, Calories: 417. MEDIUM: Serving Size (g): 339, Servings Per Container: 20, Calories: 339. LARGE: Serving Size (g): 355, Servings Per Container: 30, Calories: 355. Crumbled sausage and bowtie pasta tossed in a creamy yet slightly spicy vodka sauce. MEATBALLS: Serving size (g): 113, Servings: 2, Calories: 320, Calories from Fat: 225, Total Fat (g): 25, Saturated Fat (g): 9, Trans Fat (g): 0, Cholesterol (mg): 60, Sodium (mg): 890, Carbohydrates (g):7, Dietary Fiber (g): 1, Sugars (g): 1, Protein (g): 18. Add two meatballs for $2.35 per person with the purchase of a pasta. * Served with your choice of Malnati's housemade meat or marinara sauce. A vegetarian option if served with marinara sauce. Buffet-sized sandwiches. All ingredients are packaged separately from the bread, so you get the freshest sandwich possible. Minimum of 10 orders each, please. SMALL: Serving Size (g): 113, Servings Per Container: 10, Calories: 50. MEDIUM: Serving Size (g): 116, Servings Per Container: 20, Calories: 51. LARGE: Serving Size (g): 112, Servings Per Container: 30, Calories: 49. Iceberg and Romaine lettuce with red cabbage topped with roma tomatoes, red onions and homemade croutons. Romaine lettuce topped with romano cheese, ripe tomatoes, shaved parmesan, and fresh baked croutons. Served with Caesar dressing. Add chicken to make this an entrée salad. SMALL: Serving Size (g): 75, Servings Per Container: 10, Calories: 134. MEDIUM: Serving Size (g): 74, Servings Per Container: 20, Calories: 132. LARGE: Serving Size (g): 79, Servings Per Container: 30, Calories: 141. Romaine lettuce, diced tomatoes, black olives, sliced mushrooms, crumbled Volpi salami and gorgonzola cheese, with a touch of romano cheese. Served with Lou's famous Sweet Vinaigrette dressing. SMALL: Serving Size (g): 141, Servings Per Container: 10, Calories: 276. MEDIUM: Serving Size (g): 137, Servings Per Container: 20, Calories: 268. LARGE: Serving Size (g): 145, Servings Per Container: 30, Calories: 283. Chopped Romaine lettuce, grilled chicken, oven roasted tomatoes, shredded mozzarella, cheddar and salami served with our Club dressing and tortilla chips. SMALL PEAR: Serving Size (g): 135, Servings Per Container: 10, Calories: 172. MEDIUM PEAR: Serving Size (g): 134, Servings Per Container: 20, Calories: 171. LARGE PEAR: Serving Size (g): 126, Servings Per Container: 30, Calories: 161. SMALL STRAWBERRY: Serving Size (g): 135, Servings Per Container: 10, Calories: 163. MEDIUM STRAWBERRY: Serving Size (g): 134, Servings Per Container: 20, Calories: 162. LARGE STRAWBERRY: Serving Size (g): 126, Servings Per Container: 30, Calories: 152. Spinach with fresh seasonal fruit, red onions and crumbled goat cheese. 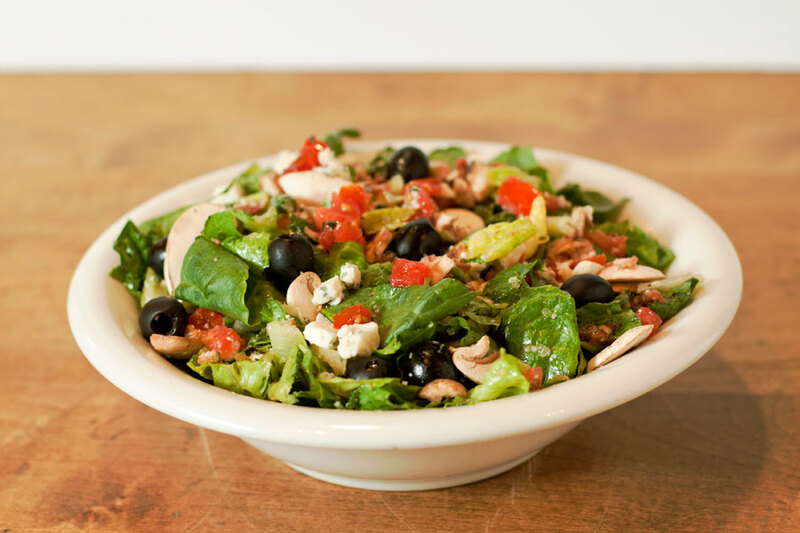 Served with our housemade Balsamic Vinaigrette. Housemade Salad Dressings: House Red Wine Vinaigrette, Low-Fat Ranch, Thousand Island, Creamy Lemon Garlic & Sweet Vinaigrette. ROASTED CHICKEN AND SPINACH: Serving Size (g): 120, Servings Per Container: 20, Calories: 195. Buffet-sized 4 oz. portion. Requires 24 hour notice and a minimum of 10 orders, please. Buffet-sized 4 oz. portion. Requires a minimum of 10 orders, please. Fresh cut cauliflower, broccoli, carrots, cherry tomato, cucumber and celery, served with housemade Ranch dressing. Fresh cut fruits including watermelon, cantaloupe, honeydew melon, grapes and pineapple. HALF TRAY: Serving Size (g): 204, Servings Per Container: 9, Calories: 448. FULL TRAY: Serving Size (g): 208, Servings Per Container: 18, Calories: 455. Fresh chopped roma tomatoes, romano cheese and fresh basil tossed in olive oil and topped with shaved parmesan. Served on housemade toasted rounds of garlic French bread. Your choice of two varieties, BuffaLou Wings with a little kick or Bar-B-Lou Wings with honey BBQ sauce, served with celery and gorgonzola or ranch dressing. Coke, Diet Coke, Sprite, Barq's Root Beer. 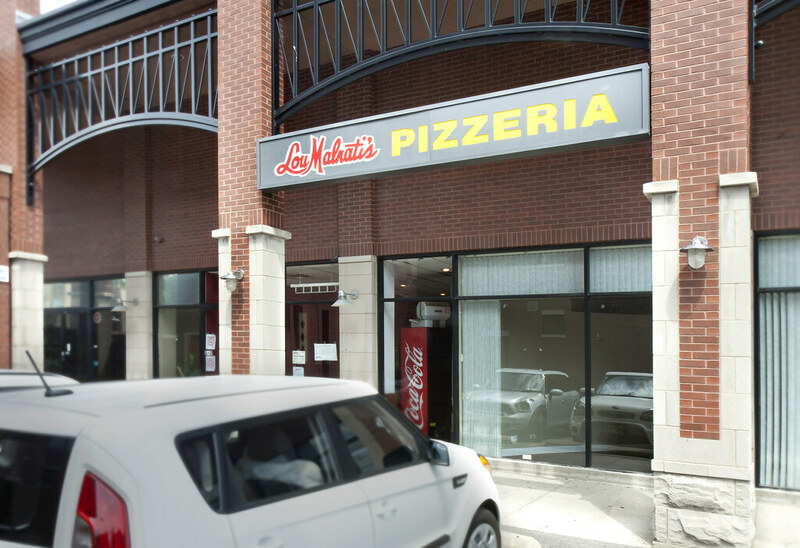 For the best pizza in Bucktown and Wicker Park, look no further than Lou Malnati’s famous deep dish pizza. 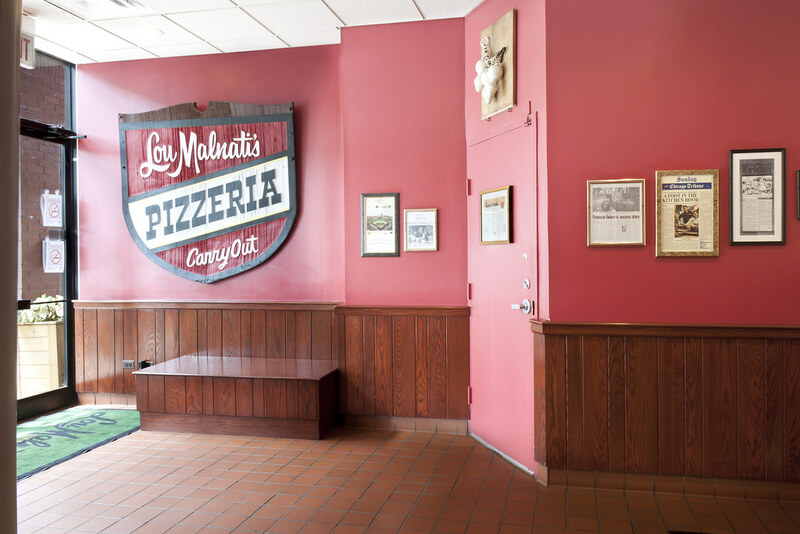 Lou Malnati’s Bucktown/Wicker Park location is located at 1520 North Damen Ave just steps from the bustling intersection of Milwaukee Avenue, Damen Avenue, and North Avenue. This restaurant has its own parking lot which makes carryout and pizza delivery orders a convenient option for those living in Wicker Park and Bucktown. Our traditional recipe and fresh ingredients is what makes our pizza the best pizza in Bucktown and Wicker Park. The foundation of our deep dish pizza is the buttery, flaky crust which starts as dough that’s patted out by hand and raised up high on the sides of a seasoned pizza pan. Next comes the tasty and irresistible mozzarella cheese that has been sourced from the Wisconsin Dairy for over 40 years! The coup de grâce is our authentic, one-of-a-kind, tomato sauce made with California vine-ripened tomatoes picked at the peak of ripeness. Bake all of these ingredients together, and the end result equals the best slice of pizza that Wicker Park and Bucktown have to offer. From neighborhood boutiques, to colorful art galleries, the neighborhoods of Bucktown and Wicker Park offer plenty of artistic avenues to explore. After shopping, you can catch a show at the nearby Concord Music Hall or take a tour at the Revolution Brewery. Just don’t forget dinner and stop-in for a delicious bite of the highest-rated pizza that you’ll find in Bucktown and Wicker Park. If you prefer to order-in, fast pizza delivery to Wicker Park, Ukranian Village, Logan Square and Bucktown is only one call away. Free parking can be found in the parking lot designated for the strip mall where the restaurant is located. Parking is also available on Damen Avenue on the east and west sides of the street. Want to join our team? We're Hiring!